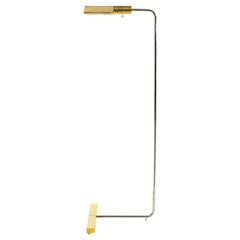 Modernist polished chrome floor lamp with matching shade, USA, circa 1970. In the style of Robert Sonneman. Takes one standard U.S. bulb, 100 watts max. Dimensions: Height 56 inches Shade height 9 inches Shade width 16 inches Base width 11 inches. Minimal vintage wear to finish. Wiring in very good condition. 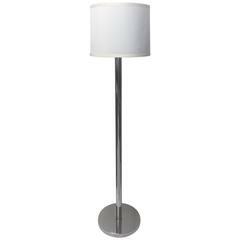 Dramatic and sleek floor lamp. Italy, circa 1970. Features two magnetic, adjustable and movable shades, one in black, the other in white, on a chrome stem, with a white metal base. 1970s chrome TOTEM floor lamp 5 bulbs E14 Beautiful lighting effect probably from Italy. Adjustable floor lamp in chrome, Germany, 1970s. Good condition. Chrome floor lamp of the 1960s-1970s. Chromed metal construction, equipped with six burners and large white bulbs. Slight age-related signs of wear, the base plate has scratches. 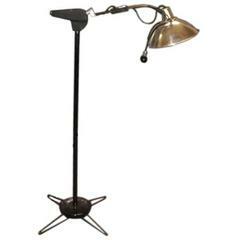 This aluminium and chrome floor lamp was produced in the 1970s, and remains in a very good condition. 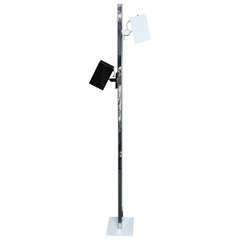 Adjustable chrome floor lamp by Laurel.